Over 30 WVSAE members and their guests gathered on August 2 and 3 at Stonewall Resort as part of WVSAE’s “Summer of Fun.” Our thanks to Tanya Cayton and the entire Stonewall staff for a tremendous event! Thursday was highlighted by a tour of the golf course, followed by a scavenger hunt criss-crossing the property on golf carts. At each of the eight stops, members answered a question before getting a token, a treat and a word. The goal of the game was to compile the branding slogan, shown above, as well as the tokens from each stop. That evening we were treated to a phenomenal dinner at the golf club overlooking the property. The food and company were outstanding, then we went to the downstairs patio for a dessert buffet, “glow golf” and dancing to the talents of DJ Nick Scott. Several folks made use of various fire pits to make s’mores. 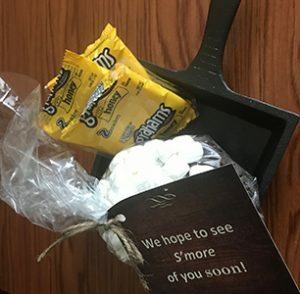 On returning to our rooms, we were each given this lovely s’more kit and cast iron skillet to take home. Friday morning featured a breakfast buffet on the cruise boat Little Sorrel. Mother Nature cooperated during the first half of the morning, then showered us with rain. Never fear, the Stonewall staff had ponchos for us all, but Patty Barnhart improvised with the table cloth. 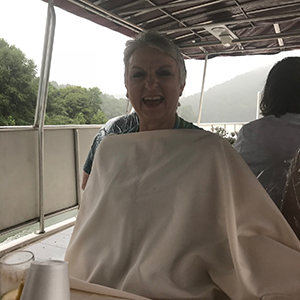 The rain didn’t dampen our fun or our enjoyment of the food, fun and hospitality provided by the entire staff of Stonewall Resort. Several attendees commented that this was the most creative and well-organized fam trip they had attended. Again, thanks to Tanya Cayton and the Stonewall staff!